Turmeric is a ginger-like root spice with many health benefits. It is also the ingredient that gives curry powder its distinct golden color. 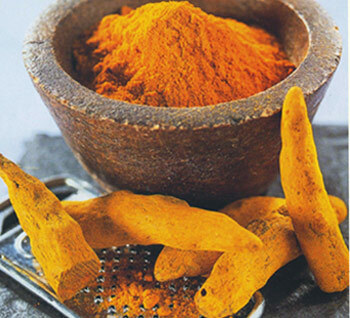 Turmeric contains compounds called curcuminoids which are potent anti-inflammatories. Studies have shown them to be as effective as hydrocortisone, phenylbutazone and Motrin, therefore making the spice useful in fighting inflammatory bowel diseases like Crohn's disease and ulcerative colitis. Turmeric is also loaded with antioxidants that neutralize free radicals and fight cancer. Aside from today's recipe there are many ways to add turmeric to your diet. My favorite is to sprinkle a quarter teaspoon into my daily six egg white omelet. It adds a lot of flavor to an otherwise bland breakfast. 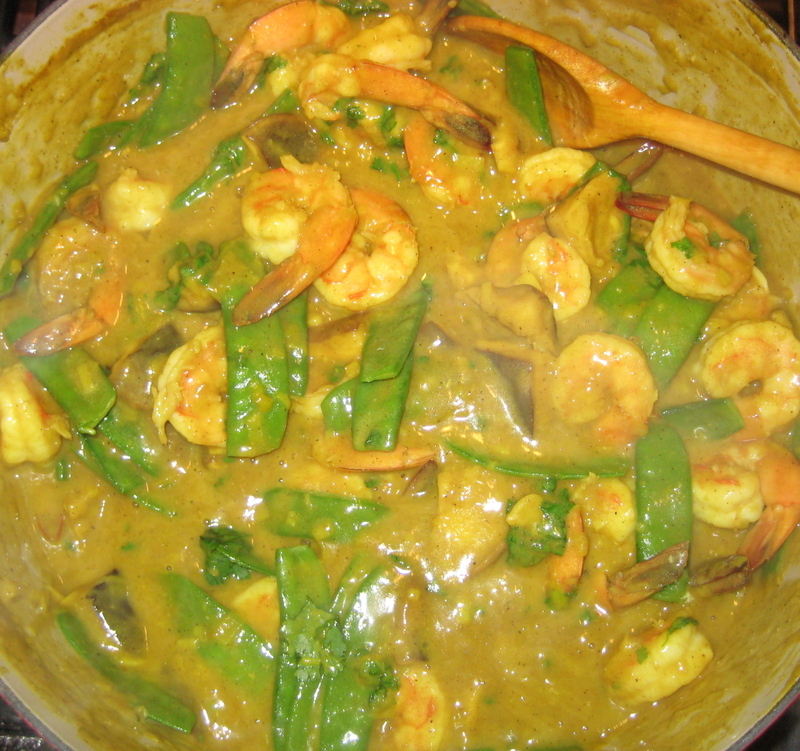 Friday night's dinner was shrimp curry. With fresh spring peas this is perfectly light in milder weather. But the warmth of the curry makes for a comforting winter supper too. It is virtually fat free, while high in protein and complex carbs. The recipe serves four to six, depending. To begin, shell and devein two pounds of large shrimp, purchased from a market that does not sell Canadian seafood. It is important to leave the tails attached because they contain most of the flavor for the sauce. Plus, I think it's a prettier presentation. As a time saver, the shrimp can be cleaned in the morning and kept cold until you prepare dinner. Or you can buy them already cleaned. You may also prep the vegetables ahead of time. The more you get done in advance, without compromising the final results, the more time you have to drink and relax with your guests. The actual assembly before serving does not take long. While you're bringing a medium pot of water to a boil snip the tips off two cups of snow peas, or, if in season, shell a big bowl of English peas. Then lower the peas into the boiling water. It is crucial not to over cook the peas. Start testing for doneness by tasting them after several minutes in the water. You will feel the correct consistency with your mouth. They should not be soft, but rather crisp-tender. They will have turned a bright green. Immediately drain the peas and plunge them into ice water to stop the cooking and set the color. Then drain again and set aside or refrigerate. Next, brush clean and remove the stems of 16 shiitake mushrooms. I have helped you by making all of the ingredients divisible by four, you can increase or decrease easily for the number of eaters. Now quarter the mushrooms so they look like this. Slice one large leek lengthwise and then thinly across. And slice four cloves of garlic, also very thinly. In a large heavy pot heat four tablespoons of olive oil over medium-low, and saute the leek and garlic until tender, but not brown. Then stir in four heaping tablespoons of flour and four level tablespoons of curry powder, and cook several minutes until fragrant and lightly golden. Very slowly, little by little to avoid lumps, whisk in four cups of fish stock. You could probably use fifty-fifty clam juice and water or white wine, but I suggest you simmer a few fish heads or buy store-made stock. When all of the stock is incorporated and smooth add the mushrooms and simmer, stirring frequently, for 15 minutes. This will add a subtle mushroom flavor to the sauce. This can be done up to one hour ahead and removed from heat until ready to assemble and serve. Raise the heat so the sauce simmers with vigorous bubbles, and stir in the shrimp. If the sauce is hot enough the shrimp should be properly cooked in two to three minutes tops. As soon as they turn pink and curl they are done. People always overcook shrimp and they lose their tenderness. About one minute after the shrimp add the peas and continue to stir. By the time the shrimp are cooked the already blanched peas will be reheated. I have to admit that I often skip the blanching and add the raw peas now. The timing is trickier this way, but it saves one step. Judge your own capabilities and don't screw up. Make sure each separate ingredient is properly cooked. When finished the bright pink and green should shine within the glossy sauce. Now remove the pot from the heat and season to taste with very little salt and fresh pepper. Then at the last second stir in the juice of a whole lemon and a quarter cup of chopped fresh herbs. I prefer cilantro, but mint or even parsley would be excellent. As a note; unless herbs are woody, like rosemary or thyme, they should always be added right before serving so their flavor is fresh and bright. Rosemary, thyme and oregano are better for long roasting or braising. The curry is great over rice, but Friday I served it atop buckwheat soba noodles. Nothing is faster or easier. Simply boil them in unsalted water for three minutes and drain. Garnish each serving with a dollop of thick, fat free Greek yogurt. As another note; you can flawlessly substitute any seafood, chicken or beef (both free range and organic) along with the corresponding stock. All measurements remain the same. 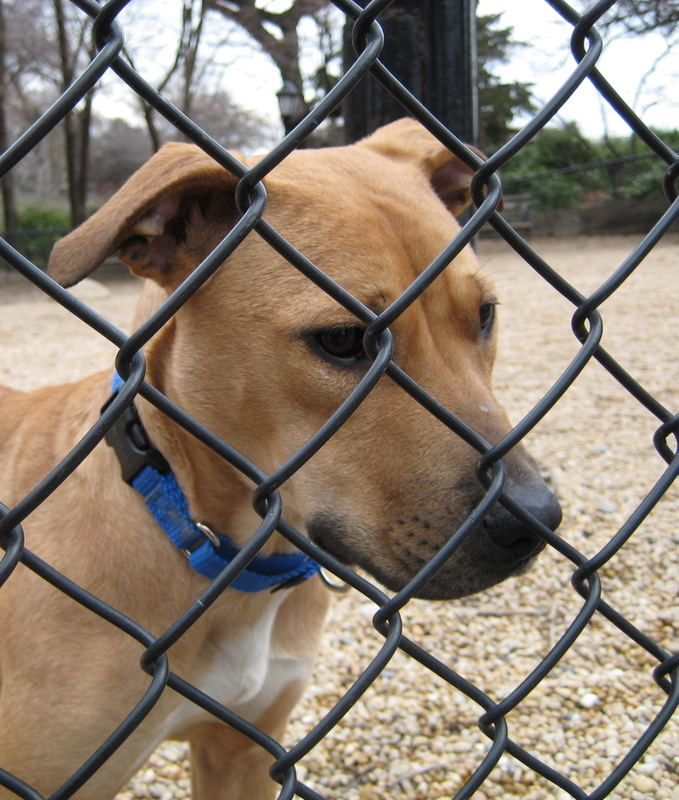 Every Wednesday afternoon from 12:15 to 1:15 the ASPCA brings homeless dogs to the Carl Schurz Park dog run. For the hour the dogs have a chance to exercise in the fresh air, and possibly find an adoptive family. Each of the four dogs had its own handler. And each was well socialized and playful. But I was struck by how differently these dogs interacted, compared to Dudley and the dogs he plays with there. The dogs who go with their owners play with each other and nothing exists outside the run. People, dogs and children throwing balls go by unnoticed. But these four stood by the fence trying to get the attention of the passers by. This sweet eight month old is named Yolanda. Every time I approached to take a picture she ran toward me, head low in calm submission. Then she would stand against the fence, nose reaching, tail wagging. 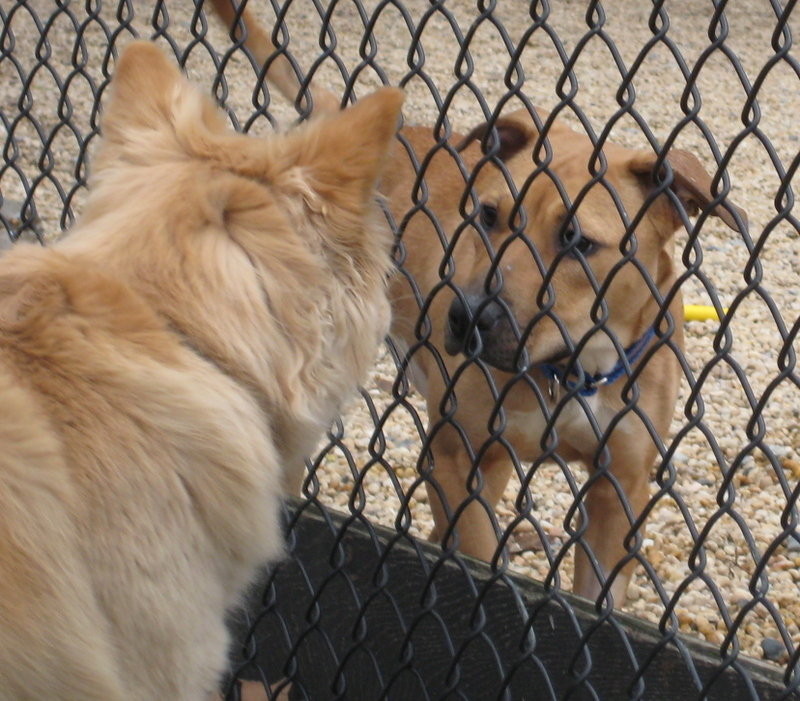 Look at her eyes in the photo of her meeting another dog on the outside. The image is heartbreaking. I cannot get her out of my mind, where I see her alone in her cell at the shelter. And I can only hope she won't become one of the many millions of healthy young dogs euthanized each year. Every dog has its own story as to why he or she ends up in a shelter. Many are strays - lost or abandoned. Others are seized and rescued from abusive environments like puppy mills and dog fighting rings. But I will never understand or accept someone willingly turning their dog over to a shelter. The day I brought Dudley home he became my family. I could give him up about as easily as anyone could give up their child. So when I hear of a dog who had a home and lost it because the owner had to move and could not find a place that accepted pets I have no empathy. But what about the unfortunate dog whose owner becomes ill or dies? I can think of at least five people living on my block who would gladly take Dudley (even if I were alive and well). And I like to imagine my family fighting among themselves at my funeral about which of them will take custody of my boy. Not all dogs are this lucky. But one was. Her name is Abigail. 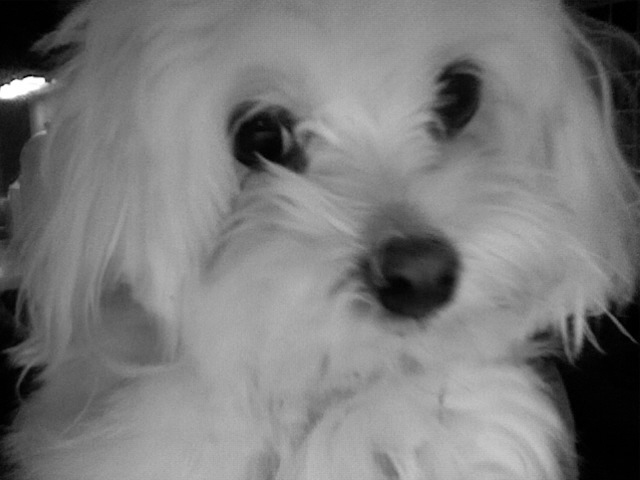 She is a six year old Maltese who belonged to my sister-in-law's step mother's mother. When the old lady had to move to a nursing home her daughter Anne took responsibility for Abigail; eager to find her a home that was not Anne's own. I say that in jest because I heard the amusing story of her hard-sell. Don't get me wrong. Anne has dogs of her own, or at least she did. And like myself, she is someone who understands animals, which I see as a reflection of one's character. I remember being at her house one summer as she looked after a lost baby bunny. Or was it a bird? 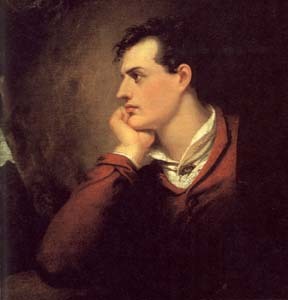 Whatever it was Anne took the creature in. I think she saw a good home with the perfect fit for Abigail. Under normal circumstances my brother and sister-in-law, like the rest of my family, were highly unlikely to adopt a toy dog. They have an English setter and said they laughed when my niece Olivia would ask for a tiny pooch. But somehow Anne found a way to get Abigail under their roof for a trial, and she hasn't left since. Everyone has fallen in love with her. She sleeps at night snuggled next to Olivia, and will never know the cold bars of a shelter. 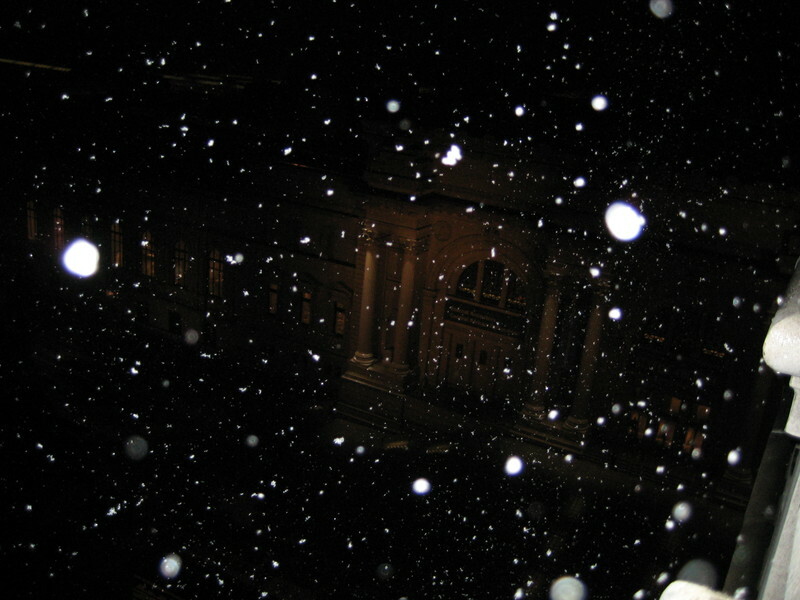 And then it started to snow and I attempted to photograph the Metropolitan Museum through the blizzard, but got mostly the flakes. Before you go on, if you haven't read Friday Nights get back there and do it. Don't be lazy, and don't go out of order. And make sure you read the Frank Bruni article I provided the link for, so it makes some kind of sense that I would offer a fish recipe on a blog filled with animals' blood and guts. I have to admit, it feels kinda creepy. But to me there is a big difference between fish and seals. And a bigger difference between eating and wearing. I eat a lot of fish. Mostly sushi. I don't worry too much about mercury, though I'm sure my levels are high, because it doesn't pose that much danger to adults of a certain age. And I would never touch swordfish, shark or farmed salmon. I also take fish oil supplements, but only pharmaceutical grade made from fish low on the food chain, like sardines and anchovies. Let's leave it at that. You should do your own research. One thing I do feel strongly about, as you know, is not buying any fish (or any thing) from Canada, as long as they support the seal hunt. Whole Foods and Wild Oats are two well known stores that refuse to sell fish from Canada. You can learn more about avoiding Canadian seafood by reading this from the HSUS. If you buy frozen fish or shrimp check the labels for its origin. Now, if you still have an appetite, here is Friday Night's recipe for oven steamed red snapper. Since I made it for three I'll give it for three, and you can do the math to adjust the number of servings. Another thing, unless I'm baking, I do not measure anything. One of the reasons I haven't finished my cookbook is that I never write anything down and readers like exact amounts. Knowing ahead I would give you this recipe I took notes, but don't be uptight about precision. Begin with three beautiful, bright, translucent fillets. These are red snapper, but you can prepare virtually any fish this way. I often do whole fish rather than fillets for a more impressive presentation. A show stopper every time. Lay the fish on parchment lined heavy duty foil. Never cook directly on tin. I realize the foil may not be necessary but I like the added support, particularly with a big heavy fish. I cooked an enormous six pound halibut fillet for a Christmas buffet. It took three sheets of extra wide foil and never would have worked in parchment alone. Dice six carrots, six celery stalks (that's two of each per person), a medium onion and three large garlic cloves. I may not be particular about measurements, but I am a stickler for presentation. When I say dice, I mean every tiny cube of vegetable should be exactly the same size. Don't come to me for "30 Minute Meals". No matter how long it takes you, if it's not perfect, as far as I'm concerned, you might as well dump a can of mixed vegetables over the fish. Friday I added several sprigs of minced rosemary to the vegetables. Thyme is just as good. However, my favorite preparation is to use whole tarragon leaves while substituting a large bulb of fennel for the celery. Sublime. In your saute pan heat about three tablespoons of olive oil. Butter tastes better, but use oil. Add the vegetables and herbs and saute until quite tender, but not browned. Using moderate heat this quantity of vegetables takes a while, but this part can be done long in advance. Now you're going to add the cognac. I like a lot - several tablespoons for each fillet. Raise the heat to high for a minute so the pan becomes very hot. Then off the heat quickly add the cognac and ignite it by tilting the pan away from you into the flame - keeping your face back. Return the pan to high heat until the flame subsides and the cognac is reduces to a mere glaze. You will notice tiny charred bits of flavor on the vegetables - see photo. Season to taste with expensive salt and freshly ground black pepper, and spoon vegetables equally among the fillets. Now enclose the fillets tightly in their foil wrappers. While you can place the packages directly on the oven rack, it is easier to use a baking sheet. Cook in the lowest portion of the oven you should have been preheating this whole time to 425 degrees. The idea of the hot oven is to keep the fish delicate by cooking it quickly. The total time for these small fillets was about 20 minutes. NEVER OVERCOOK FISH. There is no problem in removing the fish intermittently to check for doneness if you are unskilled in judging. You can remove the foil and serve the fish right out of their parchment pouches, which contain the self-made sauce. Garnish with lemon slices. Friday night I served this alongside completely unseasoned, not overly steamed baby bok choy, which tastes best plain. Or if you must, lightly salted. As if we didn't deserve an apple pie after that meal.